Gradually aging skin that’s tired from an active day gets rejuvenated while you sleep with this nighttime all natural face cream. 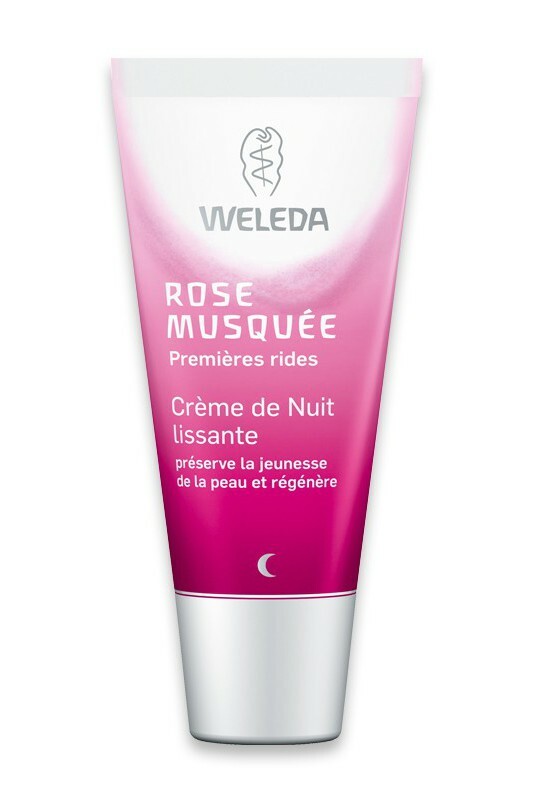 Weleda Wild Rose Smoothing Night Cream provides intensive nourishment and helps your skin’s natural growth process during its nightly regenerative cycle. Rejuvenate without harsh chemicals using this all natural face cream. Organic rosehip seed oil in Weleda Wild Rose Smoothing Night Cream is naturally rich in vitamins A and E and antioxidants that nourish and promote the renewal of youthful, healthy skin. This all natural face cream also contains organic olive oil, which contains a high quantity of vitamin E to provide deep, restorative moisture and balance where your skin needs it most. Evening primrose oil supports the natural rejuvenation of your skin for improved elasticity while smoothing away dry roughness and and first lines. With Weleda Wild Rose Smoothing Night Cream, your skin wakes up refreshed with balanced moisture and a renewed glow. Your supple, revitalized skin finally has a head start in the morning. Crème relativement riche, je n'apprécie pas vraiment la texture épaisse qui s'étale mal et l'odeur est un peu forte. Par contre je la trouve efficace, dés l'application on a l'impression d'avoir la peau toute lisse et le matin bonne mine ! 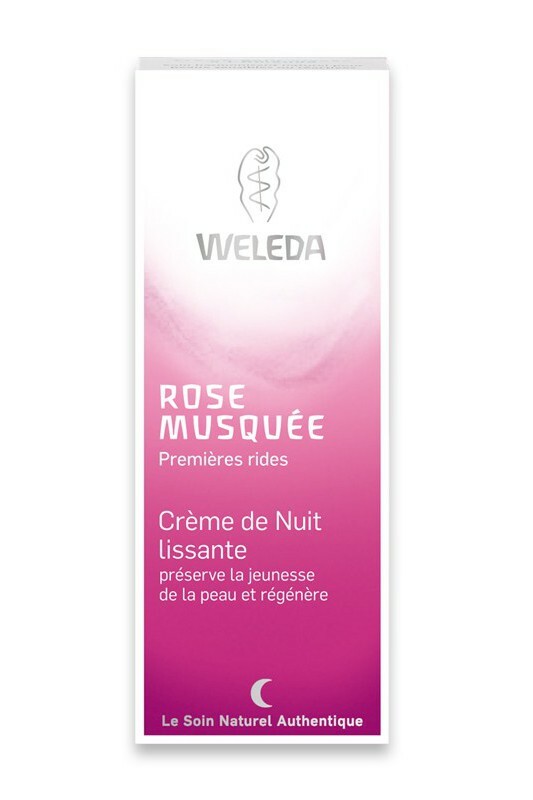 Apply Weleda Wild Rose Smoothing Night Cream to face, neck and décolleté at night after cleansing and toning. Massage in gently. Use only as much as the skin can fully absorb. To enhance the effectiveness of the cream, wrap the face in a warm, damp cloth for a few minutes. Excess cream can be removed with a tissue. Water (Aqua), Prunus Persica (Peach) Kernel Oil, Prunus Amygdalus Dulcis (Sweet Almond) Oil, Alcohol, Lanolin, Glyceryl Stearate SE, Beeswax (Cera Flava), Olea Europaea (Olive) Fruit Oil, Rosa Moschata (Rosehip) Seed Oil, Oenothera Biennis (Evening Primrose) Oil, Sedum Purpureum (Orpine) Extract, Equisetum Arvense (Horsetail) Extract, Commiphora Myrrha (Myrrh) Extract, Xanthan Gum, Fragrance (Parfum)*, Limonene*, Linalool*, Citronellol*, Benzyl Alcohol*, Geraniol*, Citral*, Eugenol*, Farnesol*.